The senior Visual Arts and Visual Communication Design undergraduate students are proud to present their graduation exhibition in Fass Art Gallery between the dates May 20-26, 2013; presenting works by thirteen young artists; Farah Aksoy, Buse Altıparmak, Yasemin Duru, Ebru Gümrükçüoğlu, Yunus Emre, Başak Cansın Ersöz, Özge Karagöz, Ezgi Korba, Ayşe Melis Okay, Dilay Özgüven, Çağatay Tuna Özkan, Mert Üngör and Nil Şimşek. Not being presented with any theme to create a coherency among the works yet being presented under the title The Last Supper, the exhibition emerges as a result of three years of artistic research and experimentation under the guidance of Selim Birsel and Can Altay. What can be observed by looking at the works of the thirteen young artists who differ greatly in their artistic approaches, is the time that they had spent together, where they have experimented with various modes to produce art while also being influenced and nourished each other in many respects in the course of this process. 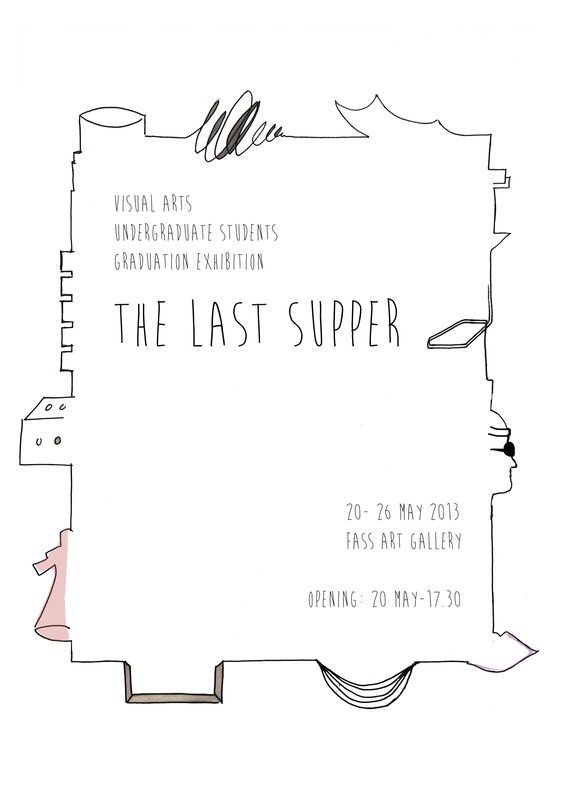 As The Last Supper marks the end of their visual arts education, the supper is also an occasion to celebrate for what the future holds in their individual artistic journeys. Each student is placed around the supper table for the first and the last time, after flourishing in the safe and independent school environment, where for past three years they have been free to put and share their personal flavors onto their plates. The Last Supper wraps up the thirteen young artists not only for their naivety that comes from their age and lack of experience, but it also offers a last gathering to portray themselves.